Wait, I thought we were only going tweaking! According to CSNNE's Joe Haggerty, the Boston Bruins will be "very active" in the trade market leading up to the July free agency period in the coming weeks, citing NHL sources. Haggerty's report flies directly across the faces of B's GM Peter Chiarelli and president Cam Neely, who have been claiming for the last month that only "tweaks" were needed this off-season. The Bruins have to carry a $4.5 million cap penalty in bonuses earned from Jarome Iginla, Dougie Hamilton and Torey Krug this past season. While factoring in the savings from Marc Savard's placement on the long-term injured reserve list, the Bruins have roughly $9 million in cap space to work with as they try to resign some of their own free agents, including Iginla, Krug, Reilly Smith, Matt Bartkowski, and Shawn Thornton. The two names Haggerty mentions are winger Brad Marchand and defenseman Johnny Boychuk. Marchand carries a $4.5 million cap hit while Boychuck carries a $3.66 million hit. Marchand just finished the first year of a four-year, $18 million extension he signed last summer. Marchand netted 25 goals and 28 assists for a modest 53 points, but contributed next to absolute zero in the postseason, scoring no goals and recording only five assists in 12 games played. Boychuk is entering his final year of his three-year, $10 million extension he signed in 2012, and this is not the first time his name has come up as a potential piece for the Bruins to move this off-season. The Boston Globe's Fluto Shinzawa suggested back on May 15 that Boychuk could be in play when it comes to other teams looking to beef up their defensive core this summer. Boychuk provides a perfect blend of experience, physicality and a punishing shot from the blue-line that other teams can be looking for to shore up their team. With only $9 million to work with and a slew of decisions to make regarding who to bring back, we can see some courses of action already taking place for the Bruins. They have some hard calls to make in the coming weeks, including whether or not to bring back Iginla on a multi-year deal and resigning Shawn Thornton. At this point, it seems the only two sure-fire players to return are winger Reilly Smith and Torey Krug, as the Bruins will do all they can to bring back the two young and dynamic skaters to the roster. Peter Chiarelli cannot bring back all of Boston's free agents with the cap number as currently constituted. Moving Marchand or Boychuk would provide the cap relief to fit a multi-year deal for Iginla, resign Krug and Smith and still have room to make another trade or two. This off-season could signal a rather large shift in the Bruin philosophy, where the enforcer role served by Shawn Thornton is no longer seen as valuable or as needed as in previous years, and the agitating and constant prodding nature of Brad Marchand is now viewed as a detriment to the club. The NHL is evolving before our very eyes, and the new blueprint seems to be out West with the power-teams of the Chicago Blackhawks and the LA Kings. The emphasis is on speed, skill, mobility and versatility. To keep pace with the best teams in the league, the Bruins may be looking to shed some of the weight holding them back. Does that mean the Bruins will pass over the 36-year-old Iginla to put a faster and more agile weapon on the top line? 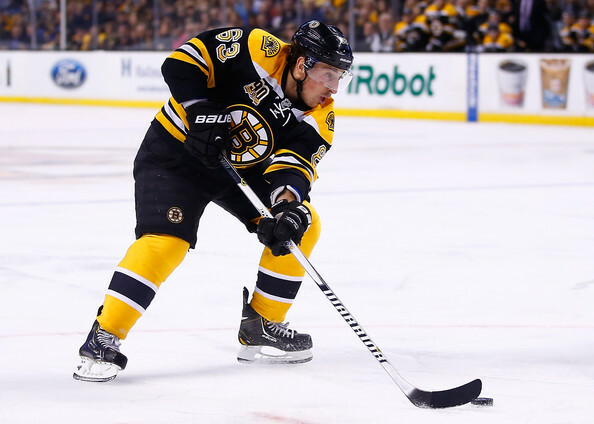 Will the Bruins trade Marchand to bring in a more consistent and responsible scoring threat? Will they retool the fourth line into a fast, skilled and hungry assortment of skaters? It seems the answers to those questions may be coming a lot sooner than previously thought. Stay tuned to Bruins Life to keep up with all the news and rumors in the coming weeks.